Dragon Naturally Speaking 13 is a speech recognition software program for Windows computers. Naturally Speaking is available in a range of editions varying in features and power offered. Naturally Speaking allows dictation and editing of text into its own word processing application and into other Windows applications. It also allows editing and voice control of a range of computer commands and of mouse functions. A Macintosh version, 'Dragon Dictate for Mac' is also available. Model Dragon NaturallySpeaking 13 Professional: Full access to all features and support services. Ability to create advanced custom commands, administration management, transcription tools and remote desktop connection. Model Dragon NaturallySpeaking 13 Home : Home version provides speech to text within emails, web browsers and word processing. Able to execute voice commands to control the computer. Does not allow for advanced correction/editing. 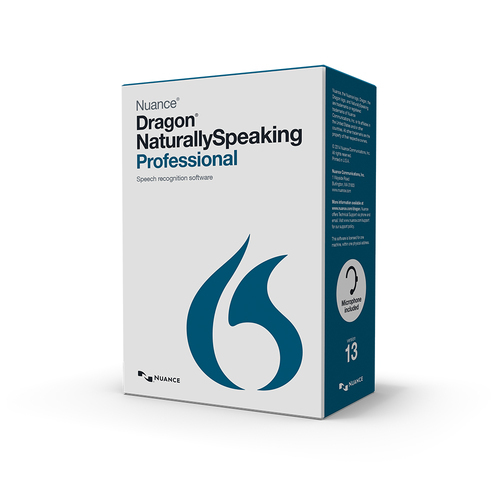 Model Dragon NaturallySpeaking 15 Professional: Full access to all features and support services. Ability to create advanced custom commands, administration management, transcription tools and remote desktop connection.